I was researching cargo bikes and just kept seeing your blog pop up. I am very interested in doing a similar set up as yours. I also was interested in elMundo initially. A sidenote on the weight of the elMundo: they are now selling it with the electric components already attached and the shipping weight of the bike and box was 100 lbs. which seemed like a lot. My plans are just like yours, I want to use it to take my 2 kids to school and errands and fun – reduce car use in general. The kids are 6 and 4 and the bike trailer is just not cutting it these days. Oh yeah! one more question. I read your post worrying about brakes. Currently with the bike trailer I often hop off and just walk up the hills. My question is, is a cargo bike easy to walk with when it’s carrying about 50- 60 lbs.? Or very tippy? Thanks for the blog. I am surprised the Yuba people haven’t offered to let you test drive their bike. Surfing I ran across another cargo biker’s blog who actually bumped into the founder/owner while on a bike tour in Europe and had a very good impression of him and a good talk with him. Thanks again. Happy biking! I am so happy I stumbled across your blog. Thank you, Jessamin. Your email reminded me that there are still a few things I can say about the Hammer Truck. For many months, I have felt a bit uncomfortable about my bike’s relatively high cost, and I have been researching less expensive bikes that might appeal to a broader market. That has been an interesting project, and I intend to continue doing it for a while. But I don’t own these bikes or ride them on a daily basis. My real expertise is my particular bike, and answering your questions gives me an opportunity to return to familiar territory. To answer your question about bike height, my wife rides the Hammer Truck very comfortably. At 5’4″, she is a little shorter than you. As you can see in this photo, the seat stem for the Hammer Truck is angled at approximately 45 degrees. When you lower the seat an inch, you also get an inch closer to the handle bars. This seems to scale well for most body types. While you’re looking at the seat, I will also mention that the inclination of the seat is adjustable. When I first started riding the Hammer Truck, I had the seat almost parallel to the ground, like a normal bike. However, the Rans web site shows their seats tipped forward, so I tried it. It feels a bit like standing and leaning against a wall. Tipping the seat puts a little more weight on your feet, and that’s what you want when you’re riding. The slight curve of the seat back allows you to dig in for a little extra leverage when you need it. These are all helpful when you really need to crank! The Hammer Truck worked fine without the motor. If we still lived in Denmark where it’s notoriously flat, I wouldn’t have needed the electric assistance. I’ve spent so much time on this blog bemoaning the hills in our neighborhood, I decided I really needed to show you what I mean. Yesterday afternoon, I put my 9-year old son behind the camera, and he took a video of me pushing my daughter up the hill, riding without assistance, and riding with the motor providing maximum assistance. You can also see from the video, pushing the bike uphill is possible, but not fun. The side bars that carry loads so well are approximately where you want to put your feet, so you have to lean over a little. It might be hard to see in the video because I’m already leaning against the hill so much. It’s not as tippy as I thought as long as both hands are on the handlebar. It would be almost impossible to do one-handed. You might notice my slightly hunched posture when I’m riding in this video. With the Hammer Truck, you generate power by pulling back on the handlebars, engaging the same muscles you would for rowing. In my case, I can produce more cranking force this way than I would standing on my pedals on a traditional bike. It’s more of a full-body workout, especially when I turn the motor off. However, this might not be a good idea for people with fragile knees. Sometimes I get distracted by all the details of this project: the specifications, the prices, the compromises. My blog is kind of heavy on that sort of thing. I occasionally need to remember that there is an emotional and even inspirational side to cargo biking, and my favorite blend of practicality and inspiration comes from the Couch Potato to Full-Time Cyclist blog. If you haven’t seen it, check it out — it’s really a great counterpoint to what you read here. Today along with my normal grocery haul, I added two propane tanks to the load on my cargo bike. I was happy that they fit nicely in my saddle bags along with several bags of groceries. The Hammer Truck continues to impress me with its versatility in this respect. Since I haven’t had any close calls on this bike, I wasn’t worried. The propane tanks weigh 17 pounds each, but I regularly ride with both my son and daughter on the back of the bike (downhill only… going uphill with that much weight is beyond my ability, even with the motor). And with my kids on it, even though the center of gravity is higher, the bike still feels stable. But today when I reached a steep downhill and was coasting at about 30 miles per hour, the bike began to oscillate side to side. Each oscillation got stronger and stronger, and I had to slam on the brakes to avoid losing control. I wasn’t sure what was causing the oscillation, but I figured it had something to do with the tanks. Sure enough, when I got home and shook the tanks, I discovered that they are not full. There is plenty of room for the liquid inside to slosh around. The sloshing must have synchronized between both tanks. Having 30 pounds of liquid moving back and forth at that speed is hair-raising, to say the least! Afterwards, I kept my speed under 20 miles per hour, and I had no further problems. In the future, propane tank transport will likely be one of the errands I save for the car. Posted on April 19, 2010 March 1, 2012 Author donCategories Cargo Bikes, XtracyclesTags recumbentLeave a comment on Sloshed! It has been a couple of months and a couple hundred miles since my last post. I really intended to update my blog more often than this, but it’s more fun to ride my bike (even when the errands are rather mundane) than to sit in front of my computer. However, there have been many ups and a few downs since November, so I will try to catch my blog up. The Hammer Truck continues to be a great bike for us, and I owe you another post or two to describe some of its features. But it’s really the electric motor that makes the whole thing practical and fun in our abundantly hilly neighborhood. On the flip side, the electric motor has also been the source of a few challenges. Our motor is the BionX PL-350, with a retail price close to $2000. I haven’t done a thorough comparison of different motors, but this one seems like it’s optimized for biking enthusiasts. It’s relatively lightweight, very quiet, and supposedly maintenance-free. But the features that really set it apart are torque sensor activation and regenerative braking. Torque activation feels really cool when it is working the way you want. The system senses the amount of torque you are applying to your pedals, and it kicks in additional power from 35% to 300% of your torque. You determine how much assistance you want by selecting one of four assistance modes on the handlebar controller. Regenerative braking allows you to reduce your speed and put some charge back in your battery while extending the life of your brake pads. There are 4 generation modes that increase the drag on your back wheel and put increasing amounts of electricity back in your battery. There’s also an option to activate the highest generation mode when you start to apply your rear brake. I really like that feature. During the first week or two, I rarely used anything but the maximum assistance mode (level 4, 300%). It’s frankly thrilling to blast up pretty steep hills at 10 m.p.h., to sprint away from stoplights as fast as most cars (at least until they shift! ), and to haul kids around with less effort than going solo on my traditional bike. With more experience, however, my strategy has become a bit more nuanced. Assistance level 1 (35% additional torque) makes the unloaded Hammer Truck feel like an average weight bike. It’s great for level ground or a light head wind. Levels 2 and 3 are good for moderate hills when I don’t feel the need for speed. For a while, I was fiddling with the regenerative levels a lot. I would sometimes put it in a high regenerative mode and pedal downhill, reversing the direction of my battery meter by a click or two. However, one day when I was doing that, the rear wheel suddenly locked up. After some investigation, we found that I had shorn off the axle nut of the rear wheel. After that, I’ve been quite cautious about pushing the limits of this bike/motor combination. Since the motor wasn’t especially designed with a loaded cargo bike in mind, and since the bike wasn’t really designed to be motorized, and since our hill probably puts us in the 90th percentile of steep neighborhoods, I’m feeling that extra caution is probably the best course for now. When you match the power mode to your legs and an appropriate gear on your chain-ring, the reward is great. With each stroke, you feel a surge of power, as if Lance Armstrong’s legs have been grafted onto your body. In power mode 4, you might be even better than Lance! It’s a beautiful marriage of man and machine – the kind of thrill you had the first time you rode your bike faster than you could run. However, this is a great solution only for someone who likes to bike already. It’s not a moped! It works best when you’re putting in some effort yourself, not just coasting along and letting the motor do the work for you. As a matter of fact, if you’re not pedalling, the motor isn’t working either. I spend a lot of time in my higher gears, even going uphill. Since the torque I’m exerting is pretty high, the motor is putting in a high level of effort as well. If I get tired and shift to a lower gear, the motor seems to scale back as well, so I end up going slower with only slightly reduced effort. Once mastered, the combination of Hammer Truck and BionX motor enables many kinds of errands by bike. It extends your speed, your practical distance, and the amount you can comfortably haul. And of course, it’s fun – I look for any excuse to get on my bike now. But is this the bike that will get millions of people out of their cars? I don’t think so. It’s a little quirky and the learning curve is a bit steep. Although it’s a good first step, the ultimate bike will be designed with an integrated motor from the outset. There are already a number of electric bikes in a traditional form factor. I haven’t seen a cargo bike with an integrated motor, and we may have to wait awhile for that. For now, this is a pretty good alternative to a second car for many of our errands. This was my first week-long self-designed tour. In the past I had added my own extensions to Cover Indiana and GABRAKY. Unfortunately, on both of these organized rides, I experienced some knee problems, and the fixed distances and schedules left me feeling locked into the event schedule. By organizing my own trip, I had the flexibility to redesign the trip on the fly and use a more personally meaningful route– riding from my home to visit family and friends in central Kentucky, about 150 miles away. See the complete tour journal. A newer, longer version of this post has been published at Building and Maintaining a Healthy Back. Two years ago I was diagnosed with a herniated disc in my back. This caused my sciatic nerve to be pinched, which caused great pain in my legs when I was sitting or standing. I spent a lot of the next two weeks lying flat on my back. After standing for just a few minutes, the pain would become intense again, and I’d need to lie back down. I’m the sort of person who resists taking medicine, and I found myself taking up to eight ibuprofen a day just to cut the pain and get through it. 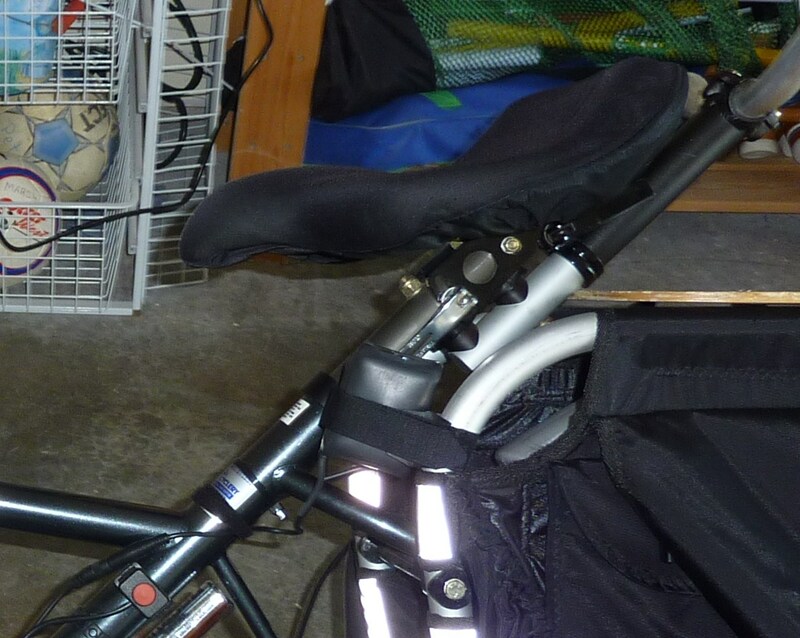 I wanted to follow the pattern of Rans V-Rex Commuting Weapon by adding an additional water bottle mount to carry a light system battery. That’s what the picture above is. There’s also a large version. Here are some notes on how this was created. Today was the first real test of my new Rans V-Rex ‘bent. After a week of waiting, the new derailleur was finally installed. I planned a twenty mile solo trip to Whitewater, Indiana and back. Out on my own, I was going to find out how the new bike compared to my old one longer trips. One part was no surprise. As a recumbent, it was definitely a more comfortable ride. The only part of me that was a little sore coming home was my legs. The ride to Whitewater was a little disappointing. I just wasn’t keeping the speeds that I wanted to. The terrain was some of my favorite– the rural gently rolling hills of Indiana, with peaks and valleys that are often only 10 or 20 feet apart in height. I did notice suspiciously that each new peak seemed a little higher than the last. When I arrivied at Whitewater, my average speed was lower that I would have liked: about 14 mph. I had not been to ‘downtown’ Whitewater before that I recall. As I ride through each of the small towns around Richmond, I have almost always discovered a new General Store or cafe that I hadn’t noticed before.